Jonathan Djanogly welcomed supporters of the charity to a reception on the Terrace of the House of Commons on Monday 24 October 2011. 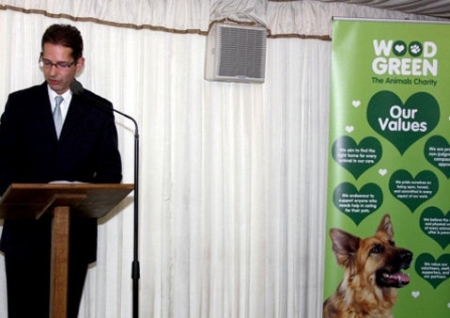 “You may have noticed that I said Wood Green, rather than Wood Green Animal Shelters. This is because that Charity underwent a rebranding exercise this year, and is now known as Wood Green, The Animals Charity, which reflects what it is most commonly called, and, more importantly, what is does. In addition, Wood Green has launched a new website, which not only tells you all about the Charity, but also gives pictures and details of all the animals available for rehoming, together with a whole section on education with lesson plans, worksheets and animal case studies for those teaching children, and session plans and other resources for those supporting young adults and students. I have to say that I think that with its rebranding and its new website, Wood Green has successfully achieved its aim of reflecting a bright, forward looking organisation, with a new lively, fresh, modern image. Of course, we are all acutely aware of the continuing difficult economic times. Happily though, with the generous help of its many supporters, Wood Green is bucking the trend. You will hear from the Chairman, Celia Waldron, how Wood Green has expanded its reach into the community, it’s hands on animal welfare work with children and young adults, and its plans for a new learning centre at its Huntingdon site. In addition, Celia will tell you about the second phase of the modernisation of Wood Green’s Heydon Centre which took place this year, and give you an update on progress on the building of the new intake kennels and veterinary surgery at Huntingdon; at almost £4M this is a landmark project in my constituency. As well as providing state-of the art facilities, this project will include a number of green, energy saving initiatives. I have been associated with Wood Green since I was elected to Parliament in 2001. At the very beginning, I was struck by what a forward thinking, innovative Charity it was. And, the things I have touched on this evening, and what you will hear from Celia, only go to reinforce my view that, thankfully, Wood Green continues to be a modern, progressive organisation today, always looking ahead to ensure it provides the best welfare for the animals in its care.